Chances are, if you’ve shopped for windows, you’ve seen the terms U-Value and R-Value. Yet, there’s a term that’s just as significant that’s not as well understood – it’s solar heat-gain coefficient (SHGC). Expressed as a value between 0 and 1, SHGC is the amount of solar radiation that passes through the window’s glazing. Simply put, SHGC is the amount of sun’s heat that enters the building. In commercial buildings, window SHGC can greatly affect energy costs. Here’s why: Climates in the Mid-Atlantic and Northeast tend to have greater heating demands. 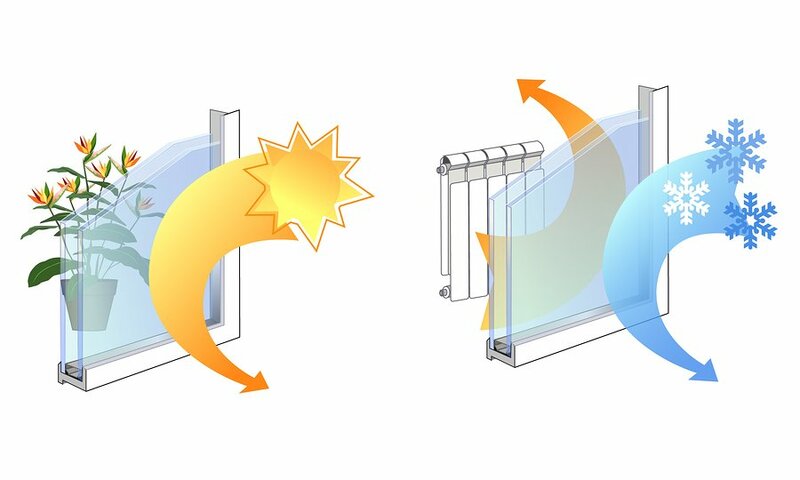 In these climates, windows with higher SHGC values may help to offset heating costs, as solar radiation that passes through a window can be used to naturally heat the building’s interior. Yet, high-SHGC windows do have drawbacks. In summer months, for instance, these windows allow more heat to enter the building, causing overheating. This can drive up cooling costs. The key to choosing the right SGHC rating is balance. Window orientation to the sun, climate, and shading conditions can all have a significant effect on the types of windows that businesses choose. What does this mean for business owners? Considering ENERGY STAR estimates most commercial properties waste about 30 percent of their energy, high-performance windows can help to drastically reduce energy costs, by as much as 20 percent or more. There are several ways in which businesses can optimize solar heat gain to offset energy costs. In particular, the biggest savings come from passive solar heating – which is important in northern climates. Yet, additional tactics like using shading to limit direct sunlight to high-SHGC windows can also help to significantly reduce energy costs. The idea of passive solar heating is simple. Heat from the sun passes through the windows, and this energy is used to help heat the interior space. This heat is then stored in a solar mass installed within the building. Sun tempering is a more modest form of passive solar heating. Window orientation to the sun is one of the most critical factors to consider. South-facing windows, for instance, collect an abundance of solar heat during winter months. Utilizing windows with higher SHGC values on south-facing walls can help to maximize the effect of passive solar heating. East- and west-facing windows, on the other hand, tend to have lower SHGC values. This is due in part in the difficulty of limiting light and heat that travels through these windows. Finally, north-facing windows collect little solar energy, and therefore, north windows are utilized primarily for daylighting. Sun tempering and passive solar heating techniques can greatly limit energy use. According to estimates from the National Institute of Building Sciences, modest sun tempering techniques – i.e. using high-SHGC windows on south-facing windows – can reduce heating requirements by 5 to 25 percent. Aggressive methods can double or triple those figures. Window shading from neighboring buildings, trees, louvers or window treatment can be utilized to limit solar heat gain. For example, with south-facing windows, the sun has a higher path in the sky in summer than during the winter. Proper shading, thusly, can limit the amount of direct sunlight that reaches south-facing windows in summer. Since south-facing windows tend to have higher-SHGC values – and therefore transmit more solar radiation –shading these windows to reduce direct summer sunlight can eliminate the risk of overheating inside the building during summer. Additionally, east- and west-facing windows should also integrate shading to reduce direct sunlight. This can be accomplished to help to reduce overheating, as well. Proper shading can result in big savings. According to National Institute of Building Sciences, proper shading can reduce energy use by 5 to 15 percent. Contact us today for more information about solar heat gain coefficient.